In the spirit of overdoing it, I remembered that I had a peltier element-cooled fridge in my lab for a while, and that the parts were still kicking around somewhere. Peltier coolers are really neat. They can use an electrical current to drive a difference in temperatures on the opposite plates. I found an interesting page with a simplified model for calculating their performance across a range of conditions. It’s interesting to note that you can’t just drive it harder to move more heat. Because the modules are consuming energy themselves, self-heating can (and often does) overwhelm the coolers ability to move heat. After spending a couple days understanding the models, I discovered an error in the page, so I’m going to re-post corrected equations. The article that I got this model from doesn’t really explain the terms at all, so I’m going to try to interpret the pieces of it. First of all, the T3 term references the entire model to ambient. If you used something else as a counterpoise, I’ll call it, to the peltier you could remove this term and model it. The middle term models the heat flow out of the hot-side heatsink. 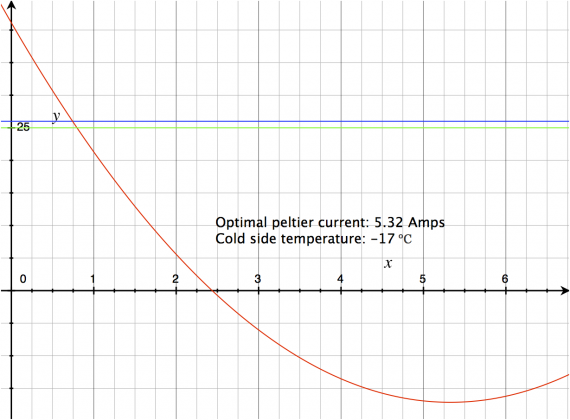 The numerators of this term are the thermal load (Q1) and the self-heating from the peltier cooler’s current (see Ohm’s law for the inspiration of this). The entire term is divided by the thermal conductivity of the heatsink, Ch. 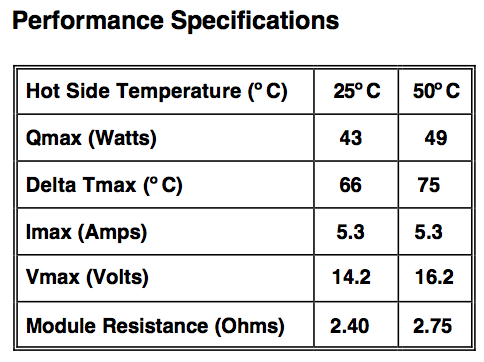 Thermal conductivity is a very useful specification, as it tells us the °C across the device per Watt. In the case of a heatsink, that is referenced to ambient. The first term models the heat flow from the load through the peltier. Again, there is the Q1 term, as we have to get the thermal load through the device. Second, we have half of the peltier’s self-heating. My assumption is that only half of the peltier’s self-heating has to travel all the way through the device. Finally, the -P*I term models the active cooling (the point of this whole thing). 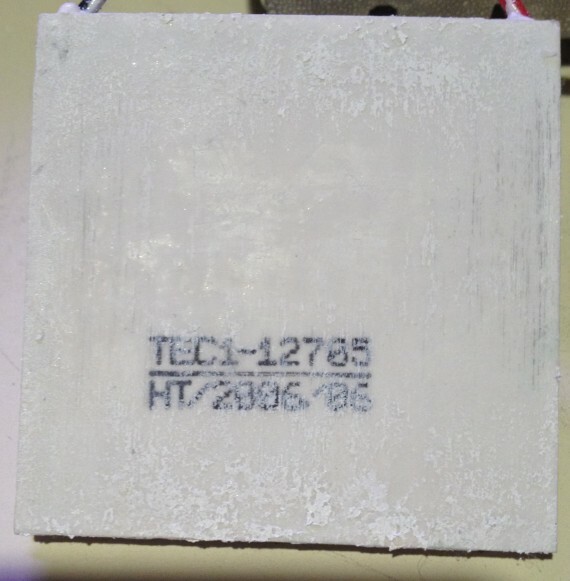 These are all divided by the combination of the thermal conductivity of the load-peltier junction and the peltier’s internal thermal conductivity. The upshot of this, is that we can model the performance of our system built around a given peltier junction given load, heatsink performance, and ambient temperature. Now, let’s make all of this a little less abstract… The image above is the module that I’ve salvaged. It’s easy enough to lookup the model number and get the data sheet. Using the specification table, directly from the data sheet, we can calculate P to be 14.47 (for 25°C). For now, let’s also choose some values for the other parameters. Let’s say we want to cool a load that is producing 10 Watts, with a rather poor heat sink that has .2 Watt per °C of conductivity (would be listed as 5 °C per Watt as resistance). T1 heat versus amps, with simple heatsink (blue) and ambient (green). If we graph T1 versus drive current, I, we can see that the optimal current from the cooler is 0.8 Amps (red line). Unfortunately, if we compare it to Q1/Ch (which would happen if we just put a heatsink on the load) it’s almost 6 °C hotter than without the peltier cooler… boo. The laser is estimated to produce about 200 Watts (20 times more than the 10 Watt example) of heat. The problem, ultimately, is that the hot-side heatsink matters. A lot. Now, what happens if we find a much better heatsink? They’re expensive, but you can find .1 °C per Watt heatsinks on Digi-key. This would be 10 Watts per °C in terms of conductivity. With the better heatsink, the cold side is down to -17 °C! The heat sink is more than able to shunt the heat from the load and the cooler. 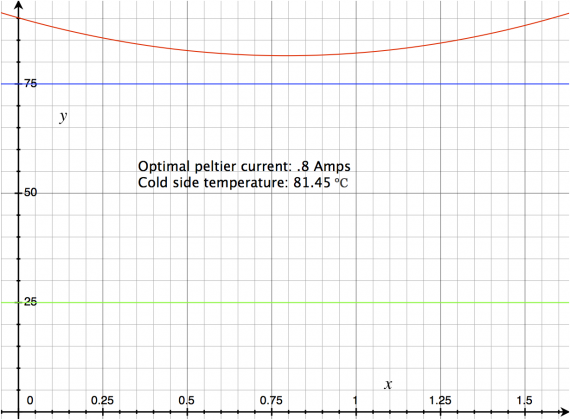 All that is obviously super-awesome, but what if we want to calculate what the ideal drive current is for a peltier cooler? The Itec equation, above, will give us this information. We still need the P and Rp terms from the data sheet, and the thermal conductivity of the peltier and the heatsink. But, you’ll notice that thermal load and the ambient temperature are not factors in the equation. Therefore, the ideal drive current (and, therefore maximum temperature drop) are not affected by those factors. I hope this has been at least somewhat interesting. Stay tuned for part two, where I investigate whether it’s really feasible (practically and economically) to move over 200 Watts with peltier elements. Also, I’m planning some research into how to characterize the efficiency of radiators in liquid cooling setups. If you have any insight, please leave it in the comments. Also, I started to write a mac application to model peltier cooler systems. I probably won’t finish it unless it seems like something people would want. Leave messages in the comments if you would pay a few dollars for something like that. This entry was posted on September 8, 2014, 3:49 pm and is filed under Electronics Projects, Projects. You can follow any responses to this entry through RSS 2.0. You can leave a response, or trackback from your own site. Thanks for the interesting (read that: way over my head) article. I haven’t found part two – have you written it? I’m trying to cool a 60 watt laser and tried two 12volt peltier modules like the ones you use here, plus heat syncs and some fans, and it didn’t work. I decided to place my cooling block in front of the window a/c unit and that seems to have helped more than anything else. If you can advise on your success I’d appreciate it. I didn’t make part two. The reason is really that I discovered in part one that it wasn’t going to be an effective or efficient solution. My current solution is a 5-gallon bucket of water and a pump. I have no active (or really passive) cooling. Ultimately, I decided to just see how much would be necessary. I have a thermocouple on the hot side of the cooling jacket and monitor the laser while it’s running. I’ve never seen elevated temperatures, so I’ve left it alone.